NEW YORK — Did you know that New York City is one of the most bike-friendly cities in the U.S.? Does that come as a shock to you? It is a surprising fact for many, including Queens bicycle accident lawyers, who talk with injured bikers every day. New York City has built more than 54 miles of bike lanes each year since 2007, and while the number of cyclists has soared the number of cyclists killed or severely injured has dropped. According to this paper released by the National Association of City Transportation Officials in 2016, more riders + better bike lanes = a formula for increased safety. While it may be true, cyclists can continue to sustain severe injuries on city streets. It’s important to follow these steps after a suffering a bike accident in Queens to support a successful recovery. If you are not severely injured, you should move out of the way of further danger quickly. If you are in pain and cannot move without worsening your injury, get someone’s attention so that she may call for an ambulance to take you to the nearest hospital. You may not be immediately able to call the police, but our Queens bicycle accident lawyers suggest reporting the accident as soon as possible. It’s incredibly important to document the facts of the accident, including who was involved and how it occurred, to file a claim later. The police will help you make a complete accident report. Your memory fades quickly, and it will quickly fade regarding the crash. Photographs help preserve evidence that can support your account of events and provide clues as to who was at fault. Take pictures of the accident scene, street signs, damage to any cars or other property, and injuries. In a bustling place like Queens, it’s more likely than not that at least one person witnessed the accident. If you can’t gather witness information immediately, work with someone to help you. The information a witness can provide about the accident is crucial to support your case. Exchange Contact Info with the Other Party. Lastly, you’ll want to call or email a bike accident lawyer in Queens who has handled cases similar to yours. If you were hurt due to another’s negligent behavior behind the wheel, you deserve justice. In accident cases, justice is typically served as compensation for a variety of hardships you must endure due to the accident. The Queens bicycle accident lawyers with Cellino & Barnes have the experience and reputation you seek to help you solidify your personal injury claim. Our job is to gather all the facts of your case to show that you were hurt and are deserving of financial redress for your medical bills, lost wages, pain and suffering, and more. If you have suffered severe trauma, you are urged to discuss your accident with an attorney promptly. Contact us for a free consultation. 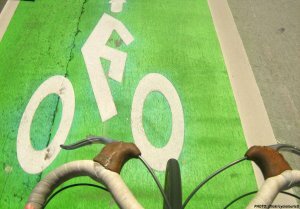 ROCHESTER, N.Y. – A growing number of people are taking to bicycle riding in Rochester and across New York State. Cycling is growing on Western New Yorkers as healthy way to commute. Our best bike accident lawyers in Rochester have found that the more bike lanes our communities add to their bustling streets, the more people feel comfortable riding a bike around. Although city planning improvements are making bike riding in Rochester safer, accidents can happen at any time. There are many actions riders can take to reduce the odds of becoming victims. Be aware of your surroundings at all times. Although your commute may feel boring, riding a bike while listening to loud music causes you to sacrifice one of your vital senses. A focused rider is more likely to ride defensively and anticipate accidents. Ride at a speed that is safe for the current conditions. Pay attention to the weather, road conditions, and volume of traffic when riding. You may have to reduce your speed to accommodate heavy traffic and maneuver roads safely. Act cautiously around vehicles with large blind spots. When approaching a truck or bus, it’s important to keep in mind that these vehicles have larger blind spots than the average car, which increases the likelihood of a truck accident. Let them pass safely. Get off your bike when crossing the road with pedestrians. Drivers are generally liable for accidents in which the car hits a pedestrian or cyclist who walks his bike across the street. Always check your bike equipment before getting on the road. Be sure to check the air in your tires, your brakes, and lights if you plan to ride after dark. Wear reflective clothing and a proper helmet to reduce injuries in the event of an accident. If we could predict the future we’d all be millionaires. It’s impossible to know when you will be involved in an accident; however, there are plenty of resources available to you in the event of an accident that leaves you with severe injuries. At Cellino & Barnes, our best bike accident lawyers in Rochester have years of experience resolving dozens of types of car accidents. Our lawyers will be happy to help you assess your accident case for FREE. It may be possible to recover significant compensation to take care of medical expenses, time missed from work, and more. Call us for a free consultation or reach out to us online. NEW YORK – More than 4,000 cyclists have been injured riding around the city in just the last year. That adds-up to about 12 people every day. Many of these victims were hit by a car while riding a bicycle in Brooklyn, and don’t know what to do. Get Medical Attention. Your health is the top priority. Even if the accident was minor, it’s always good to have a doctor take a look because you could have a serious injury – even if you’re not experiencing much pain. Don’t Let Drivers Leave The Scene. If you’ve been hit by a vehicle, it’s common for drivers to stop and make sure you’re okay. If you seem fine to them, they may want to leave the accident scene. Even if you don’t have any symptoms of an injury, it’s not a good idea to let them leave without first getting their contact and insurance information, plate number(s), and a statement. Call Police. If you were hit by a car, a police report should be filed. If you’ve been seriously injured, make sure police will be at the accident scene to help get the information you need! Document the Accident. Take pictures, talk to witnesses, and write it all down! Be sure to include contact information for everyone you talk with. Contact a Bike Accident Lawyer. In most cases, those who try to handle claims on their own are severely shortchanged by the big insurance companies. Don’t let this happen to you! There are qualified bicycle accident lawyers in Brooklyn who can work with you to help you get the best result possible. All of these can be serious hazards for bicyclists. If you want the best result possible, it’s important to fully investigate your claim. In many cases, injured cyclists didn’t even know the driver who hit them was distracted, or doing something illegal! If you’re an avid cyclist, you know how dangerous parked cars can be. “Getting doored” is a serious concern, and many bicyclists have stories about dooring accidents or close calls. Sometimes, a driver or vehicle passenger will be quick to blame you for the accident. But, know that it wasn’t your fault. Everyone has a duty to pay attention to their surroundings and avoid an accident, if possible. Too many times, this duty is neglected. If you’ve been doored by a driver or passenger, follow the steps above and contact an experienced bicycle accident lawyer in Brooklyn. At Cellino & Barnes, our Brooklyn bike accident lawyers are passionate about the people we help, because we’re bicyclists ourselves! We understand the challenges cyclists across the New York Metro Area face on a daily basis, and we’ll do everything we can to make sure you get justice. As proud supporters and members of the New York cycling community, we’re not only going to help you get compensation for your injuries; we’ll also do everything in our power to make sure your daily challenges are addressed. We know the city needs more protected bike lanes and laws that will help keep cyclists safe. If you’ve been injured, we’ll put our best bicycle accident lawyers in Brooklyn on your case. Call us anytime – day or night – for a FREE consultation. 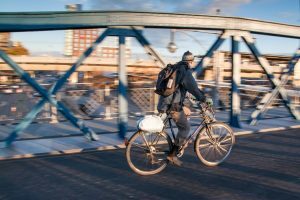 NEW YORK – Thinking about cycling to get around in the Bronx? You’re not alone. The NY Department of Transportation estimates 25% of adult New Yorkers bike the city for transportation or exercise. Of these, a Bronx bike accident lawyer says about three-quarters of a million ride a bike several times a month. Since 2006, the city has laid over 250 miles of new bike lanes, making cycling more accessible to the masses. With so many people eager to hop on a bike in NYC, it’s becoming one of the safest cities to navigate on a bicycle. By following a few safety tips, you’ll be able to conquer your fears of riding in the Bronx and enjoy the freedom and independence that comes with it. First and foremost, NYC is a pedestrian city, which means you always have to yield to them. According to a Bronx bike accident lawyer, it doesn’t matter if they have the right-of-way or not; you must always be aware of pedestrians and where they are headed. Even if they seem aloof, hiding their faces behind their phones. Road rules exist to make people’s movements predictable and keep commuters safe. As a cyclist, you take on the tricky role of a commuter who is not a motorist, but not quite a pedestrian, either. In some ways, this can make your journey more precarious. By following all the rules of the road as if you are a driver, you reduce the risk of being struck by a vehicle. Cyclists also need to adhere to rules designed specifically for them. Be sure to wear reflective clothing at night, and have functioning lights on your bike. Also be sure to use the appropriate hand signals when turning. 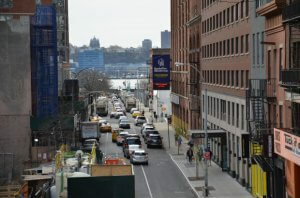 To view a complete list of NYC traffic rules and regulations, click here. Getting “doored” is a real threat in the city that never sleeps. Much of the city’s parking is available streetside, meaning that — even if you’re using a designated bike lane — you run the risk of being slammed with a car door if the driver parks too close to the lane or opens a door without looking. The more you can predict the people around you’s movements, the greater your ability to remain bruise-free will be. In New York City, children between the ages of 5 and 14 (but excluding 14-year-olds) must wear a helmet by law. Adult cyclists in the Bronx should always wear a helmet, especially when commuting on congested roads. NYC traffic laws forbid riding a bike on sidewalks unless signs indicate otherwise. Sidewalks are reserved for pedestrians only. If you must hop on a sidewalk with a bike, walk the bike until the next street. In the event of a bike accident which results in serious injuries, cyclists may turn to a trustworthy Bronx bike accident lawyer to help you pursue an insurance claim for damages. Severe injuries may lead to steep medical bills and other hardships, including lost wages, property damage, and emotional distress. At Cellino & Barnes, our experienced Bronx bicycle accident attorneys can help you understand your options for financial recovery after a crash. Call our law office for a free consultation or contact us online. NEW YORK – More than 700,000 people regularly ride their bicycles on city streets, and that number is growing, making cycling more popular than ever in the Big Apple. But crashes involving bicyclists are also on the rise. According to the Department of Transportation, more than 4,000 cyclists were injured on city streets in 2015. That’s nearly a ten percent spike from the previous year. Now, more than ever, safety matters in the cycling community – and other cities around the globe are taking notice. A new report on cycling safety in a Canadian city came to the common-sense conclusion that those who wear helmets and travel on protected bike lanes are less likely to be involved in an accident. The report was conducted to back a potential mandatory-use helmet law in the city of Winnipeg, but it doesn’t make any recommendations to city officials who are about to enact new regulations or enforce existing safety laws. However, the report notes that helmets have been proven to significantly reduce head injuries in accidents with an impact of 15 miles per hour or less. Most cyclists in New York can travel at speeds of up to 10 mph, so helmets could be a life-saving piece of equipment. Unfortunately, few cars are traveling slower than 20 mph. At these speeds, studies have shown that bicycle helmets have almost no safety benefit. Still, safety advocates urge bicyclists to wear a helmet because it does decrease a rider’s risk of serious injury. The more important aspect to bicycle safety is keeping cyclists away from cars. Dedicated bike lanes and infrastructure built on low traffic streets was found to be associated with a reduced risk of accident. In New York, work has already begun on many city streets. Since 2007, the DOT has implemented protected bike lanes on more than 72 miles of roadways. Still, the number of accidents involving bicycles continues to rise, mostly due to the growing popularity of two-wheeled transportation. For many New York families, the progress is not happening fast enough. More than dozen cyclists are killed in traffic collisions each year, and thousands more taken to city hospitals. These accidents not only cause families grief and heartache, they are also costly. The average bicycle crash can cost a family nearly $60,000 in medical expenses, lost wages and other damages. These accidents can also cause a victim to lose quality of life, and although it’s difficult to monetize, it raises the overall cost of an accident even higher. If you or a loved one has been injured in a Brooklyn bicycle accident, know you are not alone. Thousands of other New Yorkers have had similar experiences, and many of these victims have relied on the Brooklyn bicycle accident attorneys at Cellino & Barnes for help. With decades of experience, our Brooklyn bicycle accident lawyers have tried cases in court – and they’ve won. Cellino & Barnes has recovered over $2 billion for injured clients, and they will use their network of resources to help victims get the best result possible. When a negligent driver crashes into a bicyclist, the injuries can be catastrophic. Trust the team that has helped many other New Yorkers receive compensation after an accident. Contact a Brooklyn bicycle accident lawyer at Cellino & Barnes today for a free case evaluation. NEW YORK – After two years of the city’s Vision Zero plan, there’s good news coming from Mayor DiBlasio’s office. At the end of 2015, traffic fatalities in the Big Apple were at their lowest levels since 1910, the Mayor’s Management Report stated. The annual report aims to show progress or areas of concern in regards to the administration’s plans for public safety, education and healthcare. For the most part, the report highlights great strides: Traffic fatalities were cut by over 5-percent in the last year. Passenger, motorcyclist and pedestrian fatalities also dropped over the last 12 months. However, it’s not all good news in Gotham. Driver fatalities were up by over 17-percent and cyclist deaths increased 25-percent over the last year. The two statistics are concerning, a Manhattan car accident lawyer at Cellino & Barnes said. Cellino & Barnes research has found that distractions are a factor in more than half of the car crashes that inflict serious injuries to one or more parties. Car crashes also occur more often at intersections. The Mayor’s Management Report states city officials are currently examining ways to make intersections safer for drivers and pedestrians. The city’s Department of Transportation recently conducted a study on crashes involving vehicles making left turns. The statistics showed that left turns caused twice as many fatal accidents as right turns. The city currently has plans to redesign 93 left-turn intersections this fall. Cyclists in particular are concerned with the MMR’s findings. Cycling fatalities have consistently been rising since 2014. Over the past 12 months, 20 bicyclists were killed on New York City streets. Many of the accidents occurred on streets without protected bike lanes, which have been proven to make the roads safer for bicyclists. 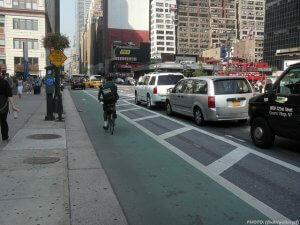 Currently, only a portion of New York City streets support protected bike lanes. Although the city is making an effort to create more lanes for bicyclists, a Manhattan bicycle accident lawyer at Cellino & Barnes says infrastructure improvements still may not be enough. Manhattan bike accident attorneys say operators of motor vehicles are usually obligated to yield to pedestrians and bicyclists in a manner that is consistent with the rules of crosswalks and streets. If you or a loved one has been struck by a negligent driver, Cellino & Barnes has helped New Yorkers for over 50 years. With offices in Midtown, their Manhattan car accident lawyers and Manhattan bike accident attorneys can help you obtain the best result possible. Contact Cellino & Barnes today for a free consultation. NEW YORK – No one enjoys the morning commute – it takes time and effort and, in almost every case, it costs money. In New York, we have more options. Not only can you drive to work, millions of New Yorkers choose to walk. If your job isn’t within walking distance, there’s the train, the subway, the ferry, or the typical New York cab. 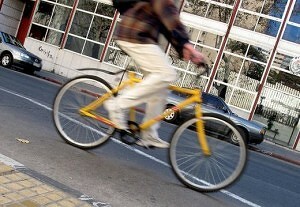 One of the fastest growing trends however is to commute via bicycle. Whatever way you choose to commute, it can be a hassle. But few have a more difficult time than bicyclists. A Brooklyn bicycle accident lawyer at Cellino & Barnes says the infrastructure is already in place for most commuters but bicyclists don’t always have an avenue for their wheels. According to the New York City Department of Transportation, Brooklyn has over 83 miles of protected bike lanes, which have reduced bike accidents by 20 percent where the lanes are available. While 83 miles sounds like a lot of ground to cover, it only covers 16 percent of Brooklyn’s road surface. Bike lanes, or the lack of them, could have a real impact on road safety too. The number of cyclists killed by New York traffic in 2016 already matches the total number of deaths from 2015, according to the New York Times. And we’re just wrapping-up the eighth month of the year. With four more months to go, Brooklyn bicycle accident lawyers are urging drivers to be careful – especially roads without marked bike lanes. One such tragedy occurred this week on Graham Avenue near Scholes Street in Williamsburg. The New York Daily News reports a bicyclist is fighting for his life after an accident on Graham Ave., one of the many streets without a bike lane in Brooklyn. The 33-year-old bicyclist flipped off his bike when a driver opened the door of their parked car on Graham Ave. The bicyclist was then run over by another vehicle, which remained on scene until first responders arrived in Williamsburg. “Bicyclists who are struck by a vehicle could have a long and difficult recovery ahead,” Barnes said. “Our firm helps them and their families get the best result possible. The Brooklyn bicycle accident lawyers at Cellino & Barnes also help crash victims recover lost wages, missing time from work, child care, transportation issues, and compensation for pain and suffering. For more legal information or bike safety tips, Like Cellino & Barnes on Facebook. 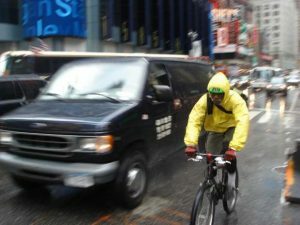 NEW YORK – The city started painting more lines on its streets – not to increase traffic flow but to improve safety for bicyclists. While many reports say bike lanes are certainly safer, they aren’t fool proof. 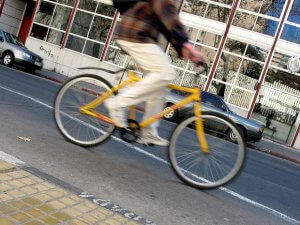 According to new research on bicycle lanes, one in five bicycle injuries occur in marked bike lanes. Almost every time, the bicyclist is hit by a car. A Manhattan bicycle accident lawyer at Cellino & Barnes said many drivers continue to be distracted on the roads and they fail to spot a bicyclist – even if the cyclist is using a proper bike lane. Nearly 200 bicyclists who spent at least one night in the hospital agreed to take part in the recent survey which was published in Accident Analysis and Prevention. Half of all bike lane crashes occurred when a car and a bicyclist were traveling toward each other from opposite directions. In these cases, cyclists reported that the vehicle cut in front of them while making a left-hand turn. One-third of the accidents happened when a bicyclist and a driver were traveling next to each other, going in the same direction. The researchers who conducted the study stressed that their findings should not be an indicator that bike lanes are dangerous. In fact, they stated that streets with bike lanes still had lower crash risks than those without them. For that reason, cities like New York continue adding new bike lanes every year in an effort to make the streets safer for bicyclists, who have long advocated the addition of bike lanes to city infrastructure. Manhattan bicycle accident lawyers say bike lanes also attract more riders than roads without markings and cyclists feel safer when traveling in a marked lane. Researchers said the high number of bicyclists using bike lanes likely factored into the sudden spike in crashes. However, there’s hope that the trend will slow down and perhaps future studies will show that bike lanes really do make the roads safer for cyclists in New York. In many cases, a bicyclist could receive compensation for their injuries if they’ve been hit by a car. Manhattan bicycle accident attorneys at Cellino & Barnes say distracted motorists are most often to blame for bike accidents and a driver can be held liable for a cyclist’s injuries. Cellino & Barnes is highly rated by clients on Martindale for quality of service and value of the settlement or verdict. If you’ve been injured by a negligent driver, call one of their attorneys today for a free case evaluation. NEW YORK – Over the last quarter-century, we’ve seen Big Macs, colas, and prescription medications with a spate of unwholesome side effects. Through it all though, one healthy trend has caught-on: bicycling. A New York City Department of Transportation report found the Big Apple has experienced a 320% daily increase in cycling since 1990. Their statistics show there are now more than 420,000 riders on city streets today – up from just around 100,000 in the 90’s. A Brooklyn bicycle accident attorney at Cellino & Barnes said this is good news for the health-conscious people in New York but safety remains an issue. The DOT says the new data shows a cultural shift in bike riding; and city planning needs to keep up. Officials believe the boom was sparked, in part, by recent redesigns of city streets. This includes more than 1,000 miles of bike lanes and the introduction of Citi Bike, the nation’s largest bike-sharing network. Brooklyn bicycle accident lawyers say with the biking boom, New York Police officers are also recording more traffic accidents. According to city statistics, more than 4,000 cyclists were injured in the five boroughs in 2014. Unfortunately, Barnes says drivers are more distracted than ever. A recent highway study found that more than 80% of crashes involved a distracted driver and more than half of near-crashes had a distracted driver behind the wheel. Brooklyn bicycle accident lawyers at Cellino & Barnes are now urging drivers to pay attention and watch for both cyclists and pedestrians on city streets. If you’ve been injured while riding a bike, you may be eligible to receive compensation for your injuries. Contact a lawyer at Cellino & Barnes today for a free consultation or visit the Cellino & Barnes LinkedIn page for more information. Is Your City Safe for Bicycles? 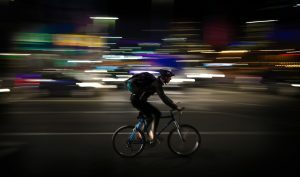 NEW YORK – The popularity of bike-riding is exploding across America and it’s grabbing headlines – both good ones and bad ones. Few places have seen a larger bike boom than New York; but recently, there have been a number of reported crashes involving bicycles, begging the question: is the Big Apple safe for bicycles? This week, witnesses told a New York news station that a bike rider slammed into a two year-old toddler ‘at a high rate of speed,’ apologized then left. These are just the incidents that don’t involve vehicles, a Manhattan car accident attorney at Cellino & Barnes said. There are many more incidents each day off the bike paths and on the streets. When comparing monthly statistics, cycling in New York City is more dangerous today than it was just three years ago. Injuries stemming from bike accidents have increased by over 25 percent, reaching nearly 570 incidents last month. In the same time frame, injuries to pedestrians and motorists have dropped as the city continues to implement its Vision Zero plan. 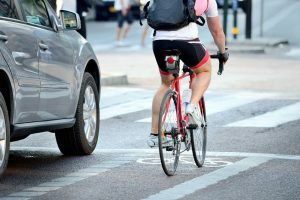 Car accident attorneys say motorists should be aware of their surroundings and courteous to bicyclists sharing the road. At the same time, bicyclists must be mindful too. It is often required by law to use roadways, not sidewalks, when operating a bike. Bicyclists are also required to obey the same rules motorists do on the streets. If everyone takes small steps to improve safety, car accident attorneys hope injuries can be prevented.